City's agreement to play at the stadium comes to an end after this season. "Without agreement of a stadium to play at next season, the club's place in the Football League is at risk," the League One club said on its website. The Sky Blues' statement comes a day before a Court of Appeal decision on whether a judicial review should take place into the sale of the stadium. City's owners Sisu say Coventry City Council undervalued the stadium by £27m when it was sold to Premiership rugby union club Wasps in 2014. "We want to avoid doubt and uncertainty for everyone connected with the club, but most importantly for fans, about where the club will play home matches next season," City's statement added. "The Ricoh Arena is currently the only suitable option available for the club to play home matches in Coventry." 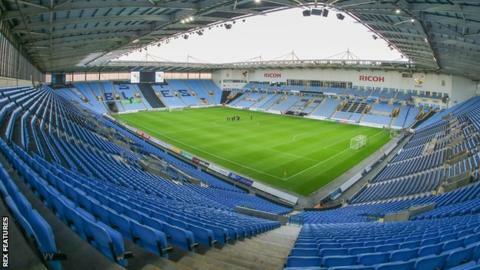 The Sky Blues spent the 2013-14 season playing 34 miles away at Northampton Town's Sixfields Stadium after the club failed to negotiate a new lease at the Ricoh.